The conditions British Troops faced in Flanders and Passchendaele. 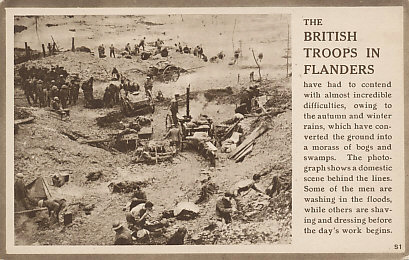 The British Troops in Flanders have had to contend with almost incredible difficulties, owing to the autumn and winter rains, which have converted the ground into a morass of bogs and swamps. The photograph shows a domestic scene behind the lines. Some of the men are washing in the floods, while others are shaving and dressing before the day's work begins. With the French sidelined after the Nivelle Offensive and the subsequent army mutinies, British commander Haig could proceed with his own offensive, without minimal French interference, and before the Americans arrived. On 31 July, 1917, after two weeks of an artillery barrage that destroyed the drainage of the land across which his men were intended to advance, Haig unleashed nearly 1,000,000 men against a comparable number of German defenders. 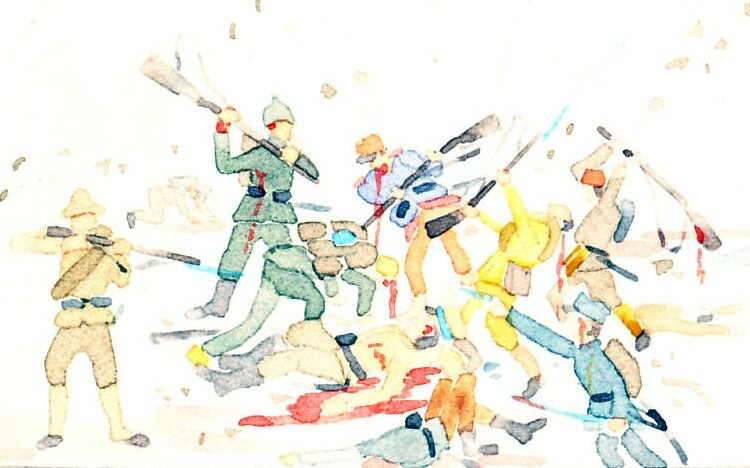 The Allied forces advanced over a mile in places in the initial assaults. Within days the seasonal rains began,and the land reverted to mud. Trenches, ditches, shell craters, all filled with water and mud in which men, horses, and field guns. Some drowned. Haig launched further attacks on August 16 and August 21. Some attacks in September gained ground: the Battle of Menin Road, on the 20th and Polygon Wood on the 26. In October the British attacked on the 4th at Broodseinde, Poelcappelle on the 9th, and Passchendaele on the 12th and 26th and 30th. The conditions of mud and rain and slaughter took their toll. For the first time in the war, the Germans found the British surrendering easily.